The NFL is no longer the only professional American football league in the world. As of February 2019, the NFL will be accompanied by the Alliance of American Football (A.K.A. the AAF). The AAF is comprised of eight teams. Unfortunately, the state of New York will not be represented in the AAF. However, plenty of former New York Giants will be seen in the Alliance. So Giants fans can use that to help them decide what team to root for. The eight teams are as follows: Arizona Hotshots, Atlanta Legends, Birmingham Iron, Memphis Express, Orlando Apollos, Salt Lake Stallions, San Antonio Commanders, and the San Diego Fleet. Ten former Giants are spread across these eight teams. The two teams with the most former Giants are the Memphis Express and the Arizona Hotshots. The Memphis Express is lead by head coach Mike Singletary. Singletary is a legendary former linebacker who played for the Chicago Bears. He will be coaching three former Giants on the Express. One former Giant on the Express is tight end Adrian Robinson. Many fans remember Robinson from one infamous quote by former Giants GM Jerry Reese. Reese was quoted referring to Robinson as “the JPP of tight ends.” In 19 career games with the Giants, Robinson totaled 5 catches for 50 yards and 1 touchdown. Not exactly prime JPP production out of Robinson, however, things are likely to change in the AAF. 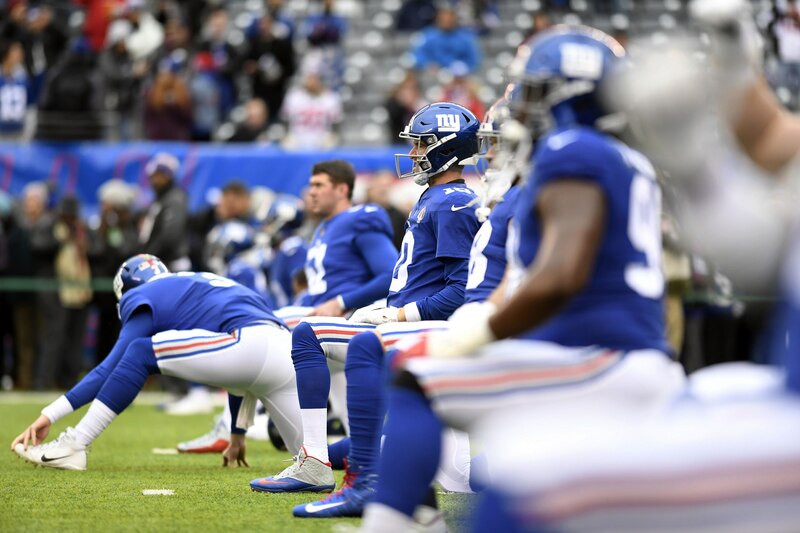 Another notable Giants playing in the AAF on the Express is the punter, Brad Wing. Wing was a popular player amongst Giants fans because of his ties with star receiver Odell Beckham Jr. Wing and Beckham are good friends and have been ever since they were teammates in college at LSU. The third former Giant on the Memphis Express, Charles James II, is another friend of Odell Bekcham Jr. James and Beckham even faced off in a friendly game of Madden when Odell was on the cover in 2016. Charles James II is a speedy defensive back who spent one season with the Giants in 2013. He played in 12 games and totaled 4 tackles. He then spent a couple seasons with the Houston Texans, one with the Indianapolis Colts, and now he is in the AAF. Three former Giants are on the Arizona Hotshots. However, none of the three played for the Giants in an official regular season game. The three players are an offensive lineman, a running back, and a safety. Running back Jhurell Pressley was on the Giants as recent as 2018. He provided some quality snaps in the preseason. Unfortunately, Pressley did not make the final 53-man roster for the Giants in 2018. He will get his chance to showcase his talents with the Hotshots in 2019. Malcom Bunche is an offensive lineman who was also with the Giants in 2018. Bunche almost made his way onto the final roster, but he got cut on the final cut day. Free safety Rahim Moore was a member of the Giants for a very small period of time. On January 12, 2017, Moore signed a reserve/future contract with the Giants. He was released by the Giants on May 25, 2017. Moore was most productive during his time with the Denver Broncos from 2011 to 2014. Maybe the opportunity in the AAF will allow Moore to regain or surpass his production level from Denver. The other four former Giants in the AAF are on the Orlando Apollos, the Birmingham Iron, the Salt Lake Stallions, and the San Diego Fleet. On the San Diego Fleet, edge rusher Damontre Moore is a name that Giants fans may remember. Moore seemed to have a lot of potential when he was drafted in 2013, but, unfortunately, he never reached his full potential. Damontre Moore is most remembered by many Giants fans as the pass rusher who roughed the passer too many times. Despite this, Moore has landed in San Diego and will look to be an impact edge rusher in the AAF. On the Orlando Apollos, another former Giant who never reached his full potential can be found. Will Hill was once a great safety on the backend for Big Blue. In 24 career games, Hill wracked up 115 tackles, 4 passes defended, and 2 interceptions. Hill looked like he could be a cornerstone for the Giants in his first two years, but then his off-the-field issues caught up with him. Hill was suspended for drug use and the Giants decided to move on. If Hill can remain clean off the field, he could be a top-tier player in the AAF. Amba Etta-Tawo was a receiver for the Giants during the 2018 preseason and training camp. He emerged as one of Kyle Lauletta’s favorite targets and seemed likely to become a backup for the Giants. Unfortunately, he too was a surprise cut at the end of preseason. A return man for the Salt Lake Stallions is Kaelin Clay. He was on the Giants in 2018 and did play in the regular season. However, Clay’s career with the Giants is unfortunately marred with one glaring bad play. In the 4th quarter of the season opener against the Jaguars, Clay muffed a punt to end the game. The Giants lost the game. Clay then suffered an injury a few weeks later and the Giants decided it was time to move on.